Twelve nights before the Royal Rumble, the 961st edition of WWE SmackDown LIVE came to you, live, from the Laredo Energy Arena in Laredo, TX. With less than two weeks until the Royal Rumble, SmackDown LIVE would determine who will be competing to become the brand new United States Champion at the much-anticipated event as both Semi-Final Matches in the United States Championship Tournament would take place in Laredo with The New Day’s Xavier Woods facing “The Modern Day Maharaja” Jinder Mahal in one Semi-Final Match while “Glorious” Bobby Roode would face Mojo Rawley in the other with the winners of the respective matches advancing to the Finals of the United States Championship Tournament at the Royal Rumble! Which two SmackDown LIVE Superstars will come one step closer to winning the prestigious United States Championship and who will leave Laredo disappointed? United States Championship Tournament: Semi-Finals: Jinder Mahal (with The Singh Brothers) def. Xavier Woods (with Big E & Kofi Kingston) by pin following the Khallas to advance to the Finals. United States Championship Tournament: Semi-Finals: Bobby Roode def. Mojo Rawley by pin following the Glorious DDT to advance to the Finals. 6-Woman Tag: The Riott Squad def. Charlotte Flair, Becky Lynch, & Naomi by Liv Morgan pinning Naomi following the Codebreaker. 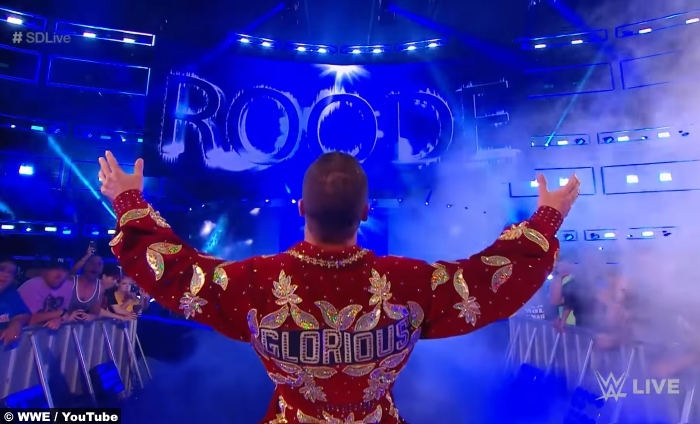 United States Championship Tournament: Finals: Bobby Roode def. Jinder Mahal by pin following the Glorious DDT to win the United States Title.